No experience needed for this adventure in Firearm Training! As long as you’re over 8 years old, and have a parent or guardian, you’re good to go. This is an unusual and popular option for international guests, corporate events, bachelor or bachelorette parties, or for any celebration, for that matter. Travelers from overseas or locals are welcome as we invite them to come and enjoy a shooting experience as a memorable part of their visit to what is arguably the most beautiful city on Earth. Did you know? In most European countries you cannot shoot. 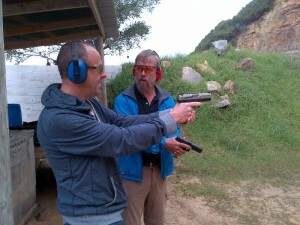 Assault firearms and handguns are even difficult to arrange shooting with. Typically, it’s only clay target (pigeon) shooting! So, come for a full shooting experience with assault weapons and handguns in a safe and controlled environment. And what an unforgettable corporate team-building exercise this will be! We will ensure that you have fun with target shooting, close range pistol shooting, aiming at cans, steel plates, you name it. Once you’re all tuckered out, you will leave with a target as a memento, full of holes, to show off to your friends! We offer training for serious sport shooting of all kinds – IPSC, IDPA, and clay target shooting. This is perfect for anyone, at any level, from basic skills right up to advanced tactical training. False Bay Firearm Training Academy – Firearm Training Fish Hoek, Firearm Training Western Cape, Shooting Training, Gunsmith, Ammunition, Hunting, Sports Shooting, Rifle Range, Hand Gun Shooting, Gun Academy, Shooting Courses, Team Building, Target Shooting, Clay Pigeon Shooting, Assault Rifles, Year end functions.